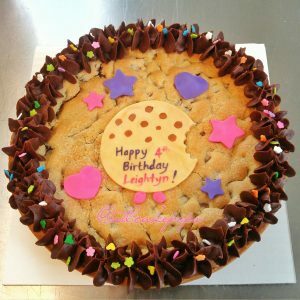 Cookie Cakes: All Cookie Cakes are all 9 inches in diameter but vary in shape. You can choose from Round, Square or Heart shaped cookie. Message: Tell us what message you want on your cake. Decoration: Identify the theme or colors you would like to consider when preparing your dessert. Feel free to upload a picture if you have something specific in mind. 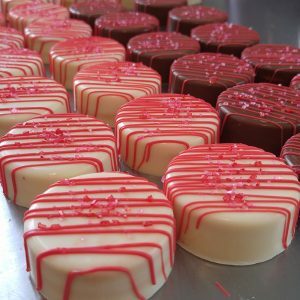 Outside Color: Dipped in milk, dark or white chocolate. All colored options besides brown, are colored white chocolate. Date Needed: We typically suggest allowing us 5 business days to prepare your order. Occasionally we can handle Rush orders, but it depends on our current orders and production schedule. (Note, additional rates may apply to Rush orders.) Please submit the date you would like to have your order and we will confirm our ability to accommodate you in our reply to your request. Shipping: We can only ship Oreos. We are not able to ship Cookie Cakes. We ship ONLY via next day express service with USPS. This will help ensure that your items arrive in the best condition possible. During warm weather, we use dry ice to prevent the chocolate from melting. (Extra costs for warm weather shipping products will apply).